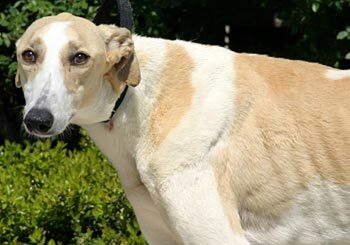 Ellis is a strikingly handsome, white and light fawn, male greyhound. His age is estimated to be 2 years as he is not tattooed. Ellis was found as a stray and turned into the Ellis County SPCA in Waxahachie. 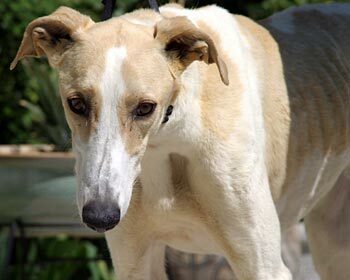 As with so many strays that GALT receives, Ellis tested positive to Ehrlichia. He was treated accordingly for 8 weeks under the care of Dr. Jeff Ellis and Dr. Christy Soileau of VCA Preston Park Animal Hospital. 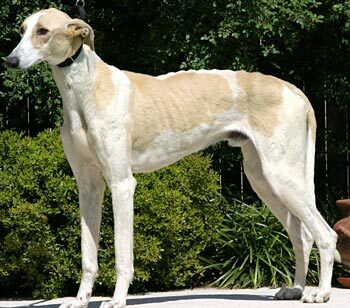 Because his titer did not drop the required two dilutions, Ellis was then given a PCR (Polymerase Chain Reaction) test performed by North Carolina State University College of Veterinary Medicine to determine a positive or negative result for an active infection. Ellis’s test was negative, and he has now completed all his medical procedures. Ellis is ready to find his forever home! It is not known at this time if Ellis is small animal or cat tolerant.